In 1974, Richter led the team at the Stanford Linear Accelerator Center (SLAC) in Menlo Park, California, that laid the foundation for the standard model of fundamental particles and forces. The team at SLAC (now the SLAC National Accelerator Laboratory) produced collisions between high-energy electrons and positrons to produce a new particle which they called the ψ. At essentially the same time, a team led by Samuel Ting at Brookhaven National Laboratory in Upton, New York, discovered the same particle, which they called the J. As a result, the particle became known as the J/ψ meson. The discovery significantly expanded scientists’ understanding of particles called quarks, which had been discovered at SLAC only a few years earlier. In 1976, Richter and Ting, who was affiliated with the Massachusetts Institute of Technology (MIT) in Cambridge, shared the Nobel Prize in Physics for this discovery. In later years, Richter participated actively in the science policy issues of the day, including nuclear power, energy technology, and climate change. For example, he and some colleagues from the American Physical Society (APS) urged Congress and the White House to reorganize the Department of Energy to create a separate undersecretary for science instead of having just one undersecretary for the entire department. In 2005 Congress passed an act that established the position. Richter was also one of a handful of scientists who in 2008 helped the then-incoming Barack Obama administration identify $20 billion worth of “shovel-ready” research projects across scientific disciplines that it would fund from the economic stimulus package called the American Recovery and Reinvestment Act that Congress approved in 2009 to counter the effects of the sudden crash of the economy. 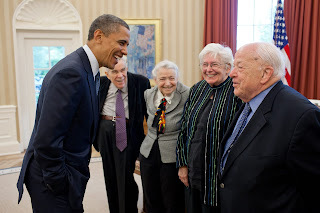 Among his many activities and honors, he served as director of SLAC, president of the APS, and was awarded the National Medal of Science and the Enrico Fermi Award. He also wrote a book, Beyond Smoke and Mirrors: Climate Change and Energy in the 21st Century , to explain climate change to the general public. I had the privilege of meeting Burt several times and hearing him speak. Two meetings that stand out for me include one at the International Atomic Energy Agency (IAEA) General Conference in Vienna, Austria, and another, when I was president of the American Nuclear Society (ANS), and he spoke at our embedded topical meeting on accelerator applications. At the latter event, he spoke on the need for nuclear power to meet the world's energy needs, and the possibility of accelerator transmutation of waste from nuclear power plants. Burt Richter was a native of New York City. He attended Far Rockaway High School, which also produced two other Nobel Laureates, Baruch Samuel Blumberg and Richard Feynman. He attended Mercersburg Academy in Pennsylvania, then went on to study at MIT, where he received his bachelor's degree in 1952 and his PhD in 1956. The country, and the world, has truly lost a towering figure, both in the realm of science and in the arena of science policy.